There are troubling rumors that a certain TV talk show host raped and murdered a young girl in 1990. I do not believe this to be true, but the lack of response concerning the matter from said talk show host is disturbing. If he did not commit these horrendous crimes, then why will he not deny these allegations? Is it possible that these rumors are actually true? ... I'm not sure why, but there seems to be something horribly wrong with this way of thinking. But said talk show host argues like this all the time, so this line of thinking has to have something to it, right? It can't be the case that a famous person that has his own television show talks nonsense on a regular basis, can it? 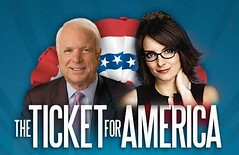 Given how much I disagree with the policies of Republican candidate John McCain and consider the policies of Democratic candidate Barack Obama to be better, I had decided that I would be voting for Obama quite a while ago. However, recent events in the presidential campaign have prompted me to reconsider my position, and I have now decided to change my mind and vote for McCain. Continue reading "Vote McCain for president"
PZ Myers' tongue-in-cheek threat to desecrate consecrated communion wafers has caused a storm of controversy throughout the World Wide Web. Personally, I think it's being way overblown by a few oversensitive Catholics. It's going way too far when there are ridiculous attempts to get him fired, a delusional paranoia of a mild-mannered professor who at most threatened to mess up a cracker forces additional security at the Republican National Convention, or death threats are sent. I would like to make a modest proposal that would hopefully be satisfactory to everyone. Instead of pelting PZ Myers with death threats and (heaven forbid) actually implementing them, I propose that a representative from the Catholic side desecrate a consecrated calamari dish for each consecrated wafer that PZ Myers desecrates. The calamari will be consecrated with an agreed-upon ritual, through which the dish will be transubstantiated into the flesh of PZ Myers. For those who literally believe that a consecrated wafer is transubstantiated into the flesh of Jesus Christ, I'm sure they can come up with evidence and arguments, which would be of similar quality to those that support their belief in transubstantiation, to justify that the calamari dish would indeed have been transubstantiated into the flesh of PZ Myers. I believe that this would satisfy all of those involved. For those who believe a cracker is just a cracker, desecrating calamari will look just like a silly response to a silly desecration of a cracker. And for those who believe that a cracker can literally be the flesh of Jesus Christ, desecrating calamari would be equivalent to doing bodily harm to PZ Myers himself, so it should satisfy their bloodlust without invoking a violent response in those that do not believe in transubstantiation. There is a hilarious cult of Jesus Christ claiming that the head of Jesus was that of a raptor. The sad thing is that the arguments for the claim were so similar to the types that some fundamentalist Christians use that I had to double check that it wasn't a real cult. Poe's Law strikes again! I wish it were the case that I could have dismissed it as satire immediately, but sadly it's the case that some Christians seriously believe some weird things and often employ confused arguments (like what some believe about thermodynamics or the power of prayer). It's sometimes really hard to figure out whether certain religious content is sincere or parody.